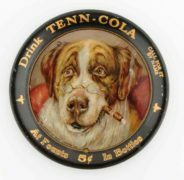 This is a beautiful porcelain sign advertising the Pleasing and Refreshing Kola Bru brand made by the Richard M. Schlesinger Bottling Works in New Athens, Illinois. Circa 1925. 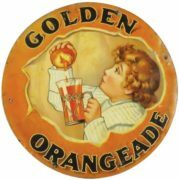 The Schlesinger soda company started in New Athens in the 1880’s by Richard’s father Michael and the family remained in business until the 1950’s. Before Prohibition New Athens was known primarily as the home of the East St Louis-New Athens Brewing company, later called the Mound City Brewery. The KolaBru brand was New Athens alternative to beer when prohibition started and was invented by Mr. Schlesinger when prohibition started. 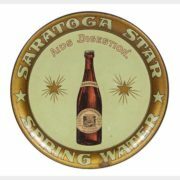 Mr. Schlesinger kept the word brew in the name but called it “Bru”. 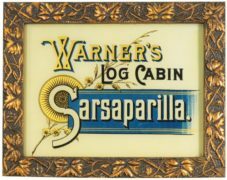 The bottle in this sign is a proprietary style bottle which is a typical style of soda bottles from the mid 1920’s through the mid 1930’s.